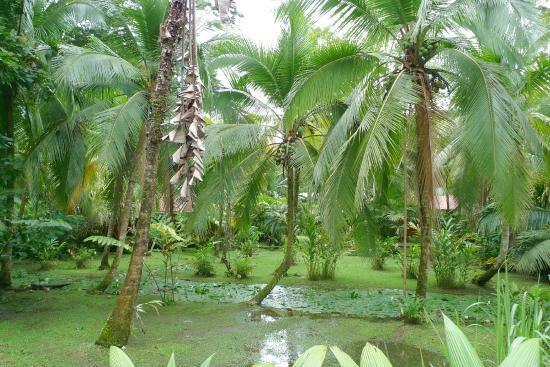 Located on the beach road 2 kms from downtown Puerto Viejo, a lush 5 acre natural tropical garden on the edge of the jungle.In front of the gorgeous expanse of the white sand Cocles beach – ” Beachbreak wave” for surfers on the north end, and the cool, sweet water of the Rio Cocles to the South.Lifestyle here, outside town, is Pure Relaxwith countless opportunities for a connection to adventure. Bungalows are privately set apart and have two large double beds, ceiling fans & hot water. Large windows open onto vistas of heliconias, bromeliads, palms, ginger and tropical fruit trees and flowers. 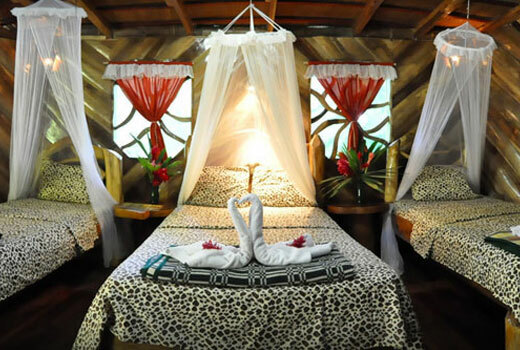 Relax in a comfortable chair or hammock in the shade of a wraparound porch set on the edge of the jungle. Owned and operated by Eddie Ryan, creator and administrator for 13 years of the world renowned Carlton Arms Hotel in New York City, in which each room was conceived by a different artist.